For there is no such thing in Trump's bubble. Where a lie's not a lie but truth's double. When my mother was asked about it, she said 1934. And she was around to know about that. BTW, there was a Daily Herald article on a fake news seminar, with commentary that alternative facts, "don't have to be outright lies." For instance, the author has as many World Series home runs as Ron Santo. I heard a similar one on the radio traffic report last week: "Due to fog, the Cline Avenue Bridge is closed at Calumet Ave." That immediately raised the question "Has the Cline Ave. Bridge been reconstructed?" Checking the NW Indiana Times, it has not. Fortunately, only one car has gone over the brink, misdirected by some navigation device. 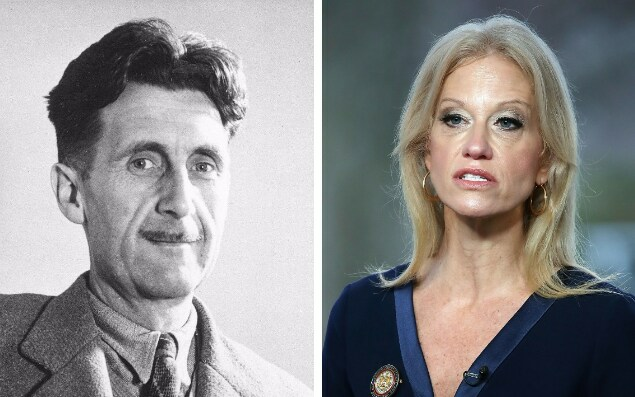 Noting his reference to Orwell, it also seems that I used the term "cognitively impaired" when the politically correct term was "fake news." No difference. That, though gets back to the question what "fake news" actually is. What seems to be the conventional wisdom is garbage shared on Facebook (see this Margaret Serious post). However, what we experienced here was someone pushing Brietbart down our throats. There's also the phenomenon, noted by Brandmeier and indicated by the destruction of WLS890, that Cumulus has this chain of right wing radio stations, mostly in small towns, consisting of callers complaining about the foreign born nonwhite then in the White House, and inventing stuff like the death panels myth, feeding the hysteria in the hinterlands. Again, distinguishing the same from the insane, I would say that while Fox News consistently hated Hillary, there was a split between the old time conservatives and Roger Ailes with his direct support of the fascist candidate and sexual harassment. However, Megyn Kelly is off to NBC. You people in Illinois should worry more about fixing your bankrupt state and how to stop shooting each other in record numbers and let Trump worry about the rest of the country. At least our governor---a Republican---is sane. Your man Trump isn't taking your advice, as he is still tweeting about the Chicago carnage. IIRC, he said someone high up in the Chicago Police Dept. had a way to clean it up in 10 days; looks like Garry McCarthy has about 7 left. BTW, are you posting on Cubs Den from a basement nowhere near Wrigley Field? Jack, I am sorry but I don't understand your question? Well, I'm sorry. Apparently I was the impaired person who such geniuses as Cliff and cubustible forced off that great political discussion board, Cubs Den. Maybe if you thimk about it, you will figure it out, but it was based on your Rush Limbaugh introduction "You people in Illinois..."